In addition, if you have a big number of people you need to make name badges for, then you can take advantage of using Word's Mail Merge feature to standardize and speed up the process. To begin, open Word, go to the Tools menu and select “Letters and Mailing". Now select “Mail Merge", and in the side bar that appears, select labels. At the bottom of this sidebar under Step 1 of 6, click on “Next: Starting Document". After you have selected your printing options, choose your label size by clicking on the next step, “Label Options". At the screen that comes up, for “Label Products" I have chosen “Avery" which is a brand that I am familiar with and is readily available to me, but you can choose which ever option is best for you. Scroll through the different options until you find Avery 5390 Name Badge which is 2.17" high by 3.5" high or some other product you prefer. 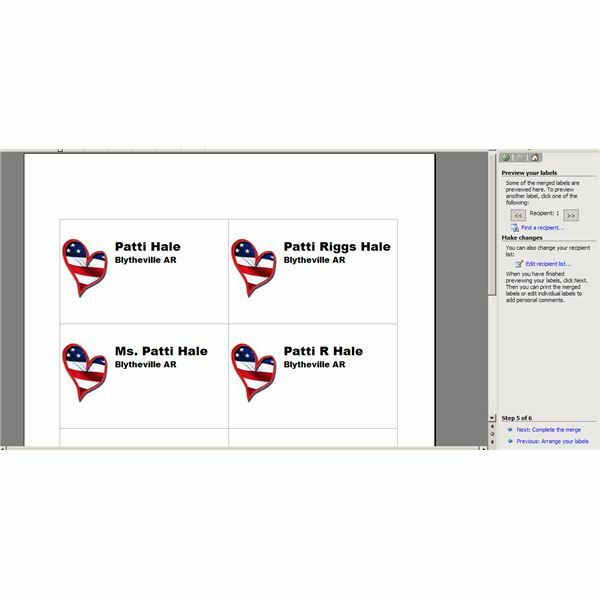 After you click “OK", your document will change to a layout of perfectly sized name badges, which, if you would rather, you can now start filling in with your different names using the Name Badge 5390.dot template in Bright Hub's Media Gallery, or the template made by your selection. However, in order to use the mail merge feature and to standardize all of your labels, I suggest you continue on to the next step: Step 2 of 6, Select Recipients. If you already have a list, select the first choice and in the option below these choices select “Browse" to go to your list on your computer and then select edit recipients if that is something you need to do. For this tutorial I will assume you do not already have a list and will choose “Type a New List" to show you how that is done. When you change your choice to “Type a New List", the option “Create" appears in the block below. Click on “Create" and a box will appear where you can type the names of your list in one by one. Since the only thing that I want to appear on my name labels is the person’s first and last name and the town and state where they are from, that is the only information I am going to type into my list. If you would rather have information about the company name appear instead of the person’s location, you could choose to fill in the company name or even their title instead. After entering each entry, select “New Entry" to keep adding names until finished and then click close. You will now have a chance to save your list under whatever name you desire. Now go on to Step 3 of 6, “Arrange Your Labels" by clicking the link at the bottom of the sidebar. To me, this is the most important step for getting the appearance right and the standardization of all the name badges. In order to customize your name badge, I suggest choosing “More Items" because it allows you to choose only the fields that you want from the database — particularly handy if you are using a mailing list that has more information in it than you would want to have on a Name Badge. In this example, I chose the following fields: First Name, Last Name, City and State. 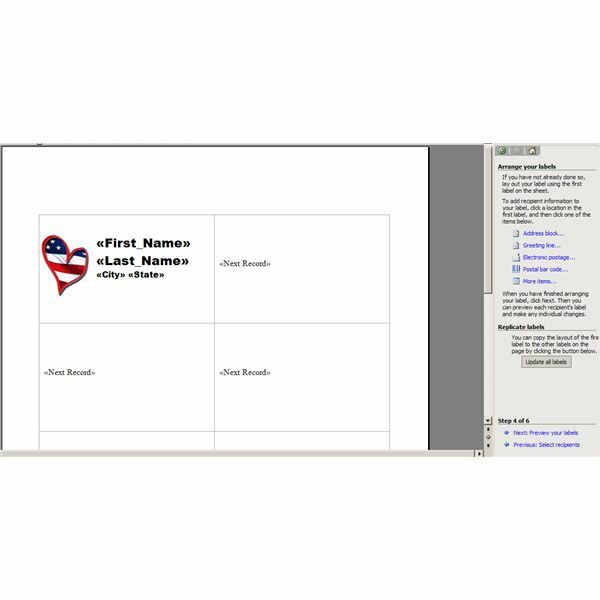 These fields will later be filled in from your mail merge list so do not change the symbols and field names since this gives the mail program its clues as to where to insert each name on your list. After the fields are inserted, arrange them where you want them (first and last name on the first line, city and state on the second line.) Now choose the font and font size that you want for the names and the location. As an added touch I included clipart as a placeholder for the logo of your organization or company, which I inserted after I had my fields arranged. To insert clipart place the cursor in front of the first field, go to the Insert Menu and choose Picture> from file. If needed, resize the picture that is inserted by clicking on the dots and moving the image in or out to resize the picture. With the clipart selected, choose “Picture" under the format menu, click the “Layout" tab and choose the third text wrap option (tight) with the alignment of the text to the right. After making this choice, your text layout may go to the top of the label and not be centered vertically. To remedy this, place your cursor in front of the first field of text and hit enter until you have the label centered. If everything looks the way you want, duplicate the label by choosing the “Update Labels" button under the “Replicate Labels" heading. What you are looking at is only the first page of name badges. It is not until you go to the next step, “Complete the merge" that all of your names will appear in the labels. Before this happens, you have a chance to make changes by going through and reviewing each recipient. This might be helpful to do to make sure a name is not misspelled or too long for the space allowed and gives you a chance to edit it before printing it and ruining a sheet of labels. The next step is completing the mail merge, which will give you labels for everyone on your list. Again, you will have a chance to preview all of the labels and be able to edit them individually in order to make them appear as you want. For example, for long names you may want to change the font size for that individual label or use an initial for the middle name, etc. If everything looks good, either save it for another day or hit print. After the name badges have been printed tear them apart at the perforations or cut them to the correct size with a paper cutter and insert them into the sleeves. 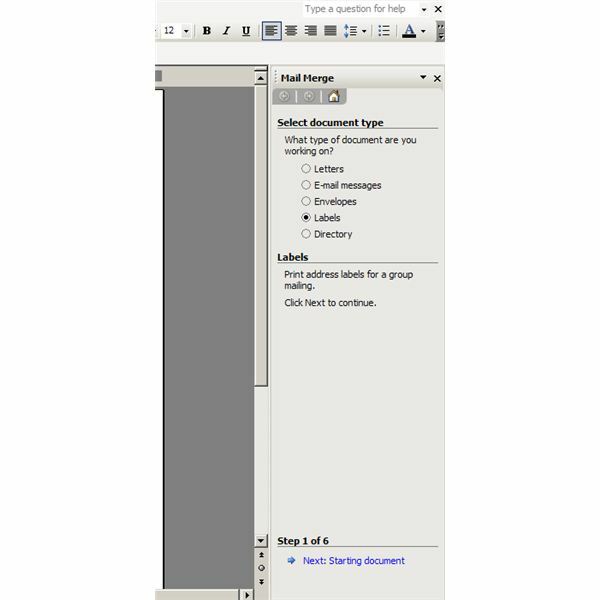 If, after you have printed your list, you find you need to add more names or make corrections, you can always edit the existing labels and change the names to the ones you need and choose “current page" in the printer selection to keep from printing the entire batch again. 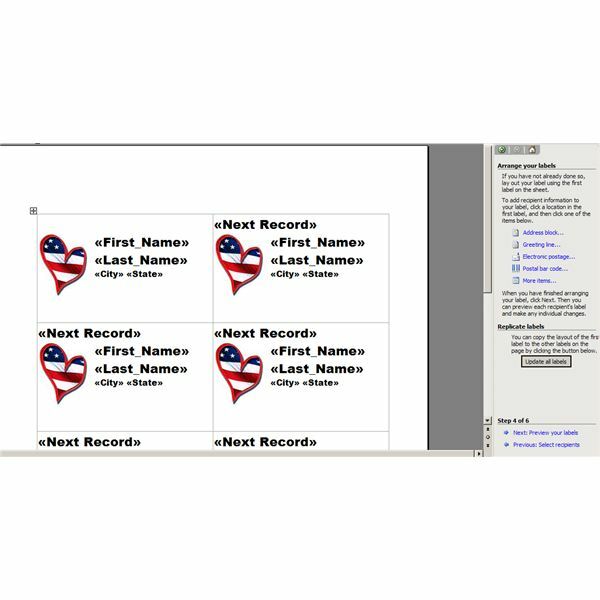 However, if you only need one out of a page of eight labels it will print an entire page, including the rest of the names on that page. To keep from ruining the entire page of labels you might consider temporarily deleting all of the other names (but not saving your changes) in order to use that sheet of labels (minus the one you used) again. Using this method is one of the easiest ways I know of to make your own professional name badges. Making use of the name badge templates in Word and the use of reusable plastic sleeves gives a very standardized professional look to your badges. A much better alternative, I think, to the old magic marker and generic sticky labels, that are used once and then tossed! If there is any part of this tutorial you have questions about, please let me know in the comments below and I will get back to you.